The struggle to preserve the Salton Sea rages on as its shoreline retreats. During migration season, birds pack the wetlands at the edge of the Salton Sea. Ducks dive, pelicans skim across the water’s surface, and hundreds of other species stalk the shores and bob on the surface of California’s largest, and most unusual, lake. The Salton Sea is a vast, shallow body of water percolating in the hot desert inland of San Diego and a key stopover point for many birds migrating along the Pacific Flyway. Over the years, as other wetlands along the flyway have been lost to development, drought, or other causes, it has taken on an outsized importance for migrating birds. Nearly all of California’s population of eared grebes, for example, stop over at the lake, and at least a third of all the white pelicans living in North America dip in and out of its waters on their migratory travels. 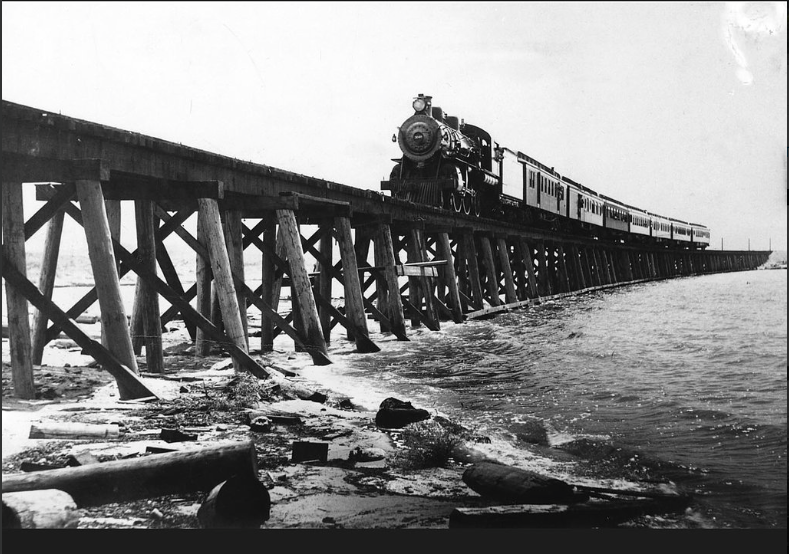 Southern Pacific passenger train crosses to Salton Sea, August 1906. Photo via USBR. The Salton Sea took on its modern mien about 100 years ago, when an irrigation canal full of water from the nearby Colorado River broke open. It took nearly two years for the breach to be fixed, and in the meantime, Colorado River water gushed down into the Imperial Valley. The valley, as it happened, had no outlet, so the water pooled in a depression near its northern end, in the hollows left behind from lakes that had filled and dried that region many times over the geologic past. Eventually, the waters ballooned out, forming a vast, glistening inland lake covering over 350 square miles. And thus was born the modern Salton Sea. But the lake was in a hot, dry part of the world where summer temperatures routinely hover far above 100F. Left to its own devices, it would have quickly evaporated away in the beating desert sun. But in the 1920s, locals decided to use the lake as a place to divert all the water that ran off the farms that carpet the surrounding valley. In essence, they put the lake on long-term life support. The district had rights to vast quantities of Colorado River water, and agriculture was booming in the valley, so in those early decades plenty of runoff went rolling downhill into the lake. 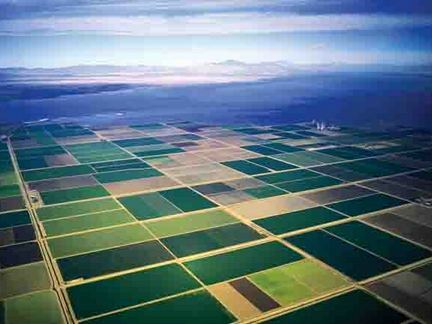 The full extent of the new reality for the Salton Sea hasn’t yet fully manifested, says Bruce Wilcox, a secretary with the California Natural Resources Agency who oversees Salton Sea policy. The lake’s surface has dropped about twice as much this year as it did the year before, but it will take some time to really feel the impacts, he says. But the future is going to be challenging under the best of circumstances, Wilcox warns. Over the next decade, the lake is projected to shrink by thousands of acres each year, exposing nearly 100 square miles by 2028, and nearly triple its current salinity—unlivable for most things that live in water and inhospitable to anything else along its shores. The loss of the water was not a surprise: some variant on this plan has been in the works for decades. Shoreside debates have raged over how to manage the shrinking lake. Some want to fill it back to its mid-century depths, in an attempt to recapture its glitz and glamour. Others want to do whatever it takes to keep the wetlands habitat intact. Currently, the state has a plan in place to reconstruct wetlands over about half of the area that will be exposed in the next decade. But so far, the plans have been stalled, with only one project on the southern end of the lake inching forward. And at the same time, the costs to human health from a shrinking lake have grown more obvious. As the lake recedes, it leaves behind vast swaths of playa, full of fine-grained material that had collected on the lake bottom over the last century. Wind kicks up dust from the playa, which irritates lungs and is loaded with all the compounds and materials that have run off from agricultural lands over the years. Exactly what’s in the playa dust and what that does to human lungs is not yet fully known, but it could include a slew of organic compounds and minerals that exacerbate the already high asthma rates in the county. All plans to deal with the shrinking lake focus heavily on tamping down the playa dust. “Now, this is a desert, so we will never stop dust from blowing,” says Wilcox. But many different strategies—from dumping water on the surface to building landforms that interrupt the winds’ path over the dusty playas—are being tested and, hopefully, implemented soon, says Wilcox.